Italians are very good at making art out of everything and anything: architecture, food, fashion, life enjoyment and above all (ahem) art itself. Since I moved to Italy though I realised that this approach of turning everyday actions and objects into expressions of pure beauty extends much further and much deeper than the aforementioned obvious stuff. In Italy, it seems, everything needs to look its best, needs to be just-so, and the intrinsically Italian concept of ‘bella figura‘ is applied even to mundane things like… warning signs. Yes, you would expect an Italian villa to be splendid and an Italian fresco to be simply out of this world, but if you live here, rather than just visiting for a short amount of time, one day you look beyond these things. 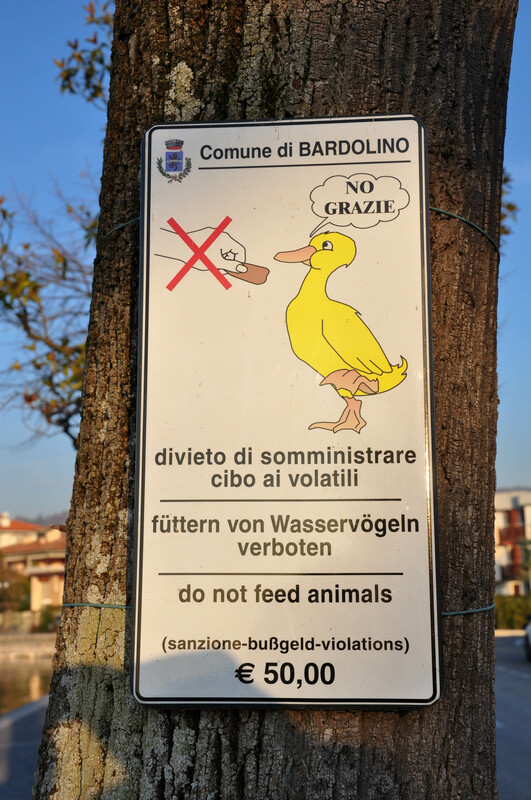 This is when you realise that even a simple sign like this one below telling you with words and pictures not to feed the ducks or else you will be parting with 50 euros in the shape of a steep fine, is like a work of art. 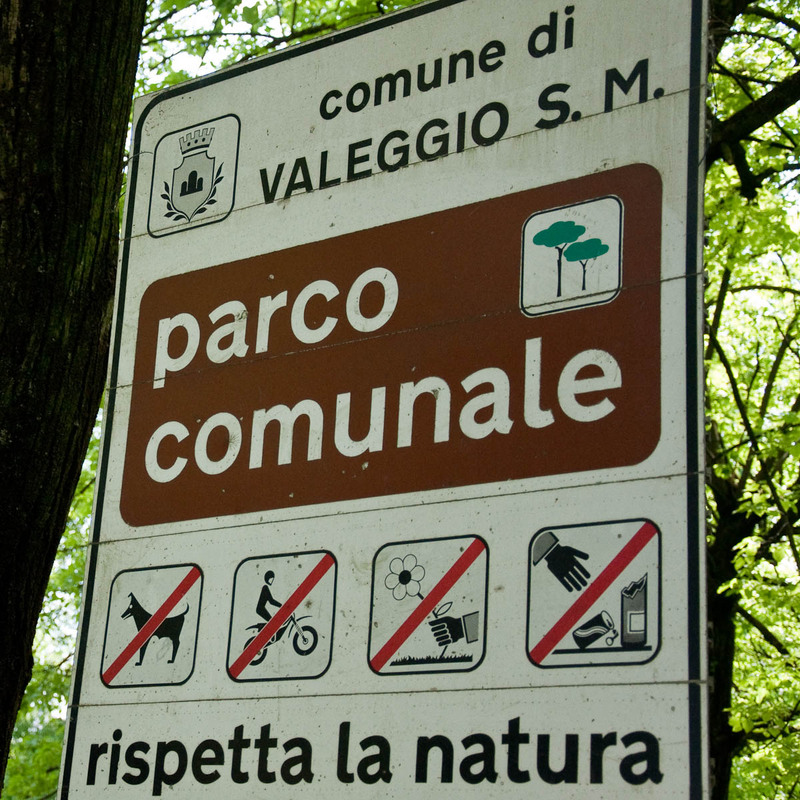 The special Italian art of warning signs, that’s it. 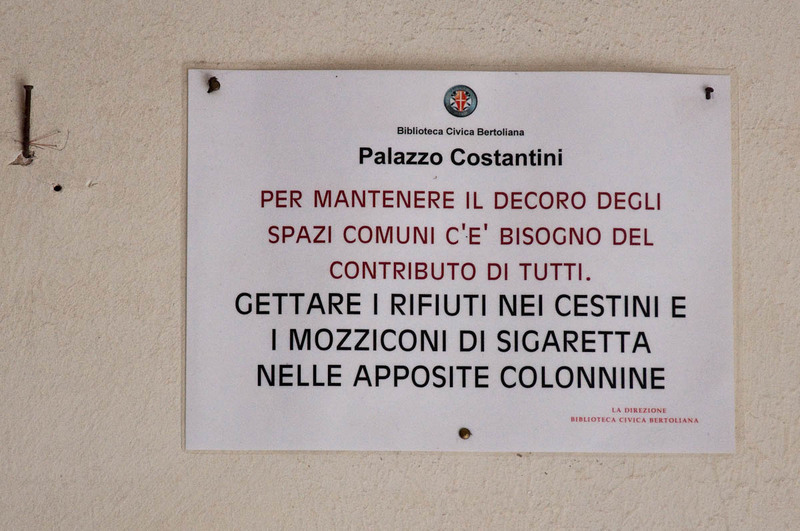 Having been forced to obey all through my life short and brusque warnings pinned to walls or flashed on display screens, I am now rediscovering warning signs in all their Italian beauty. And based on my humble observations, they take warning signs seriously here. If you are in a park, for example, there will be a big board with lots of words and many pictures illustrating what you are supposed and not supposed to do. So no matter what language you speak, you will get the message. 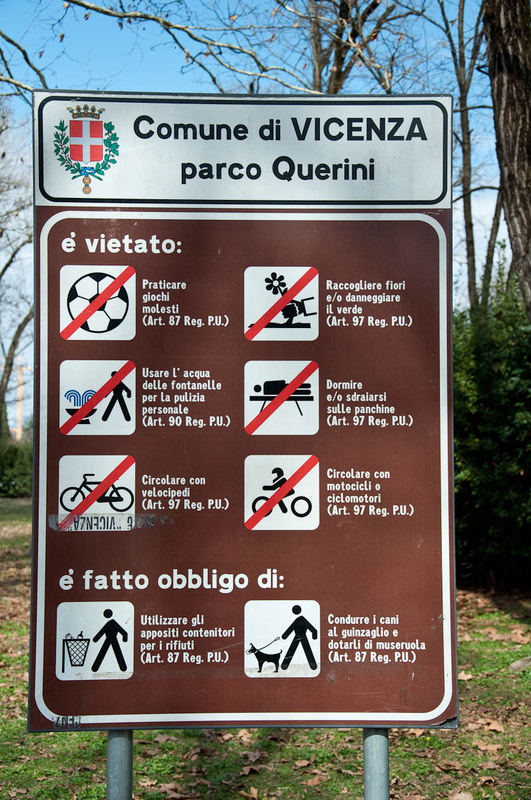 Some signs, like the one above, go even as far as quoting the specific article of the law which prohibits that you use the water in the public water fountains for the upkeep of your personal hygiene or that you circulate mounted on your bike the alleys of the park. Other signs, like the one below, are more concise, yet their pictorial representations of the good behaviour that is required from you, leave you in no doubt as to what transgressions you can’t make. Yep, there is a world of a difference with the curt ‘Take Your Litter With You’ – which rolls on the narrow black screens hanging above the platforms of London Underground’s stations. And it is nothing like the signs warning you to ‘Keep off the grass’ in Bulgarian, which used to be pinned in each and every one of my home country’s parks. The latter actually became sort of a cult phrase in Bulgaria, as there is only one letter difference between the word for ‘keep off’ and a rather vulgar term back home, hence often these signs had been scratched and scribbled on so as to change the official spelling of the warning to the offensive one. No such inappropriateness here in Italy. No matter if they have been placed by the council or by a private/public body, the warning signs seem super respectful, exceedingly formal and ultra detailed, carefully indicating not only what you are not supposed to do, but also why exactly you are not supposed to do it. Have a look below. 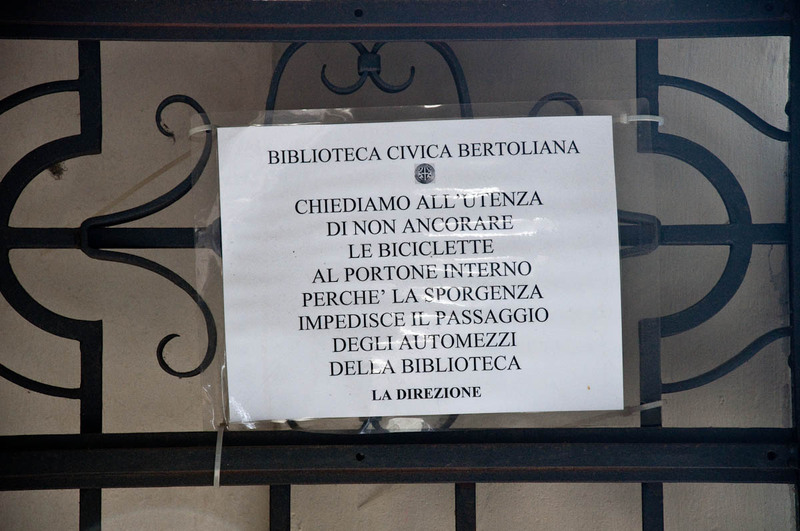 I spotted this polite request attached to the wrought iron gates of the Bertoliana Civic Library in Vicenza. It first asks the cyclists not to attach their bikes to the internal doorway and then goes on to explain that this is because said bikes protrude and impede the passage of the library’s vehicles. In London, under the same circumstances, there would often be a very short and to the point warning along the lines of ‘Chained bicycles would be removed’. And once in Bulgaria I actually saw someone, admittedly a private individual rather than a public body, who had scribbled on his garage door: ‘Don’t park. I puncture tires’. I understand the person who wrote that must have had his or her reasons to be so direct (like droves of inconsiderate drivers parking right in front of his or her garage), still if you are telling me what to do, it would be nice if you were a bit more civil. 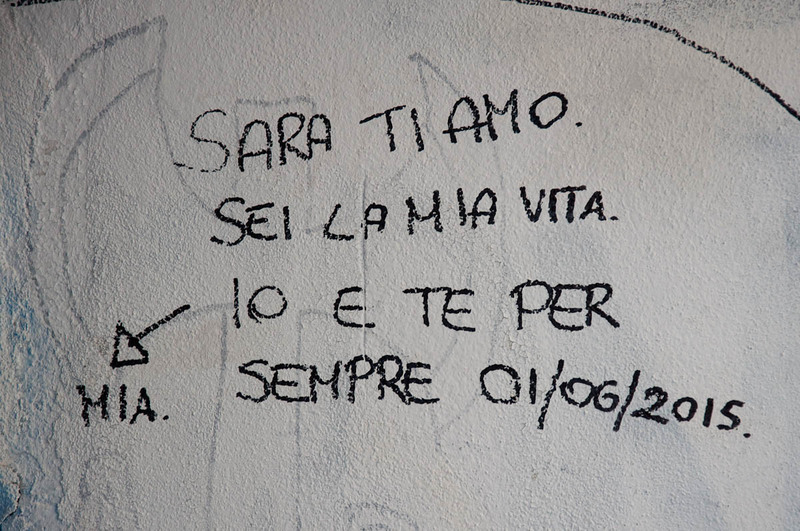 Just like this little note, also spotted at the Bertoliana Civic Library in Vicenza. It basically says: ‘To maintain the decorum of the common spaces, the contribution of everyone is needed. Throw the rubbish in the bins and the cigarette butts in the designated disposal receptacles.’ So polite! So refined! I actually felt so compelled to comply, I felt bad for not having any rubbish on me to throw straight in the provided bin. 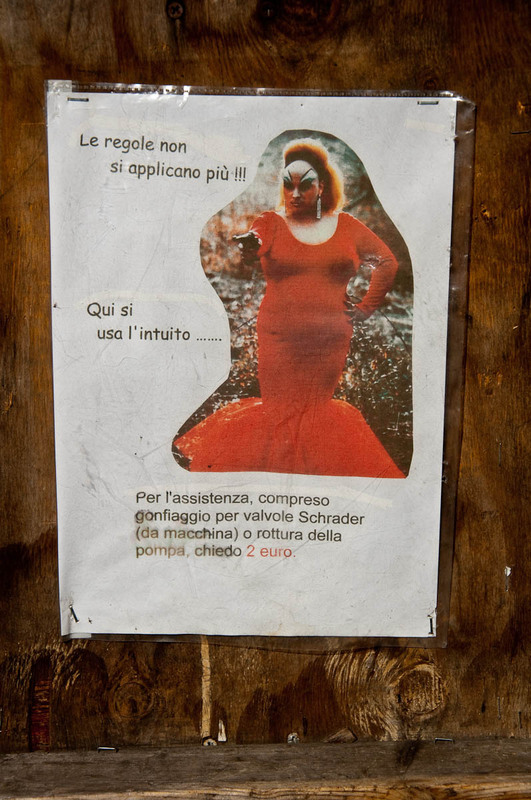 To round off this little blog post, here is a sign which makes me laugh every time I pass by it on the streets of Vicenza. 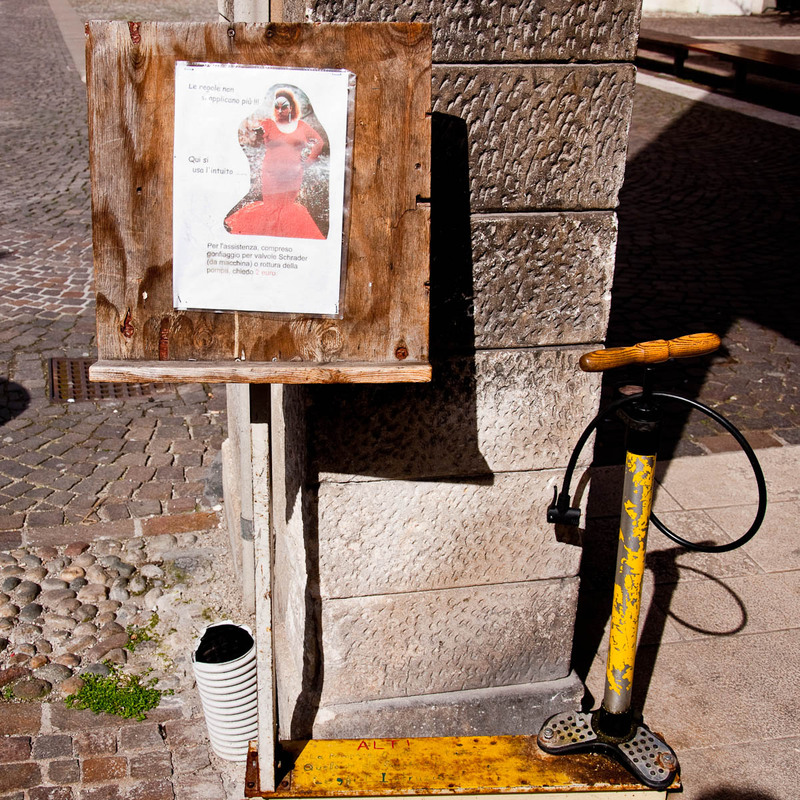 It is in front of a bicycle shop, right by a hand pump, provided by the shop owner for passing cyclists to pump their tires for free. There is a bit of a background story here. This is actually the second sign that had been placed outside of this particular shop. The first one was much more detailed and very polite. It explained that the owner of the bicycle shop had provided a pump for the passing cyclists to use if they needed to. Very detailed instructions followed as to how to operate said pump. And in conclusion, there was a note to say that several pumps had already been broken by cyclists not using them correctly. As each pump had cost X euros, which the shop owner had paid from his own pocket, he was very politely asking the cyclists just to be careful and considerate. It seems like the pump got broken again and then one morning the new sign appeared. I think it is ingenious, especially having seen the first sign and knowing the back story. So, this is all from me for today. I hope you found the little stories above interesting and funny. Italy is certainly a country where art is abundant, but you don’t have to go to a museum, to experience it in its most human and imaginative form. Often, just observing the locals gives me abundant reasons to enjoy life as an artistic expression. And even though this one last sign below is not a warning, but a public declaration of love, I thought it is quite suitable to end my writings with it, as it is so open, sincere and poetic, that even though it is scribbled on the wall of a centuries-old building, there is something so inspiring about it, I never fail to smile when I see it, even when I am feeling down.